Home Parent Programs What our parents say? The choice of school you make for your child is one of the most important and most difficult. How happy do you consider your son to be at Manchester? What is your perception of the academic work that your son is engaged in? What is your perception of the extracurricular activity that your son is occupied in? In general how do you perceive the ethos of Manchester? How effective do you consider the leadership of the school to be? Would you recommend Manchester to other parents ? “I have no hesitation in recommending Manchester International School to other parents. Communication between the school and parents is good, the school is always up-to-date with how the child is getting on, and there’s always a friendly face if parents have a question. 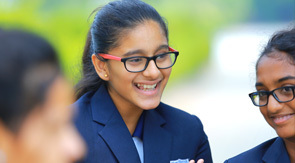 And it is so happy to know that Manchester is awarded regularly as one of the best International Schools of India. Keep it up Manchester International School !". - Dr. Matilda, Parent of Cliff Josh Grade 9.